We've got some delicate and delicious items to help you celebrate spring. See a legend and description of the handcrafted chocolates we make. Learn about our haute drinking chocolate - an Aztec style hot chocolate using the best chocolate and a blend of spices. 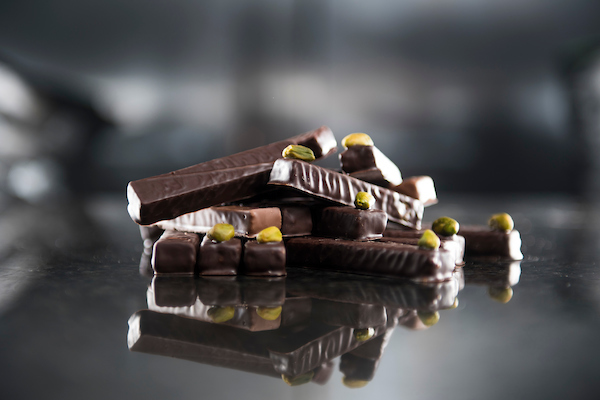 Learn about our decadent confections and corporate gift options. Scroll below to see more about our confections, haute chocolate drink and corporate gifts. Everything is made from scratch, by hand, in small batches, with the freshest ingredients we can find. Free of preservatives and additives, our chocolate isn’t made to sit on shelves for long – so dive in and enjoy. Here are just a few of our unique flavours. Download a PDF of our legend here. The chocolates with an * are just a few of our International Chocolate Award winners. A creamy, crunchy milk chocolate praline with coconut confits and 70% Almond praline. Apricot caramel enrobed in dark chocolate. A 72% Venezuelan dark chocolate flirt with the prune notes of Armagnac liquor, a grape brandy from southwestern France. A beautiful 46% milk chocolate from the Dominican Republic that carries a creamy, caramel note. A 66% Ecuadorian dark chocolate with a balanced citrus taste featuring a hint of Grand Marnier. A 62% dark chocolate ganache from Brazil with playful notes of black tea and apricot. A milk chocolate ganache with a subtle taste of espresso. A 66% dark chocolate from the Caribbean featuring a fruity undertone. This crunchy white chocolate ganache incorporates sour cherries and toasted coconut flakes. A smooth, 68% dark chocolate from Ghana paired with Morello cherries. A 66% dark chocolate from Ecuador paired with Cascabel chiles from Mexico delivers subtle heat with oak and floral notes. A 66% dark chocolate from Ecuador with subtle cinnamon notes and a surprising pop finish. An 85% dark chocolate from Ghana paired with Cognac produce an assertive and powerfully long finish with soft tannic notes. Fine coconut with a hint of tangerine and white chocolate bathed in rich dark chocolate topped with a candied violet. A Tahitian and Madagascan vanilla bean caramel accented with Murray River pink salt from Australia. It takes the bold flavour of Earl Grey tea to stand up to this 64% dark chocolate from Madagascar. A great getaway at teatime. A sophisticated 72% Venezuelan dark chocolate paired with mango and passionfruit. A 72% Venezuelan dark chocolate that lingers on the palate. Beautifully smooth and anything but bitter. A milk chocolate ganache enrobed with a 67% blended dark chocolate. A 64% dark chocolate from the Dominican Republic subtly infused with fresh ginger and finished with a sliver of candied ginger. Crunchy hazelnut milk chocolate praline with a satisfying toasted gluten-free crêpe finish. Perfect for the nut lover. A complex 67% dark chocolate that starts with floral notes from Herbsaint, a New Orleans liqueur, and finishes on an interesting licorice note. An interesting play on flavours featuring a light, savoury and sweet milk chocolate curry blend topped with Matcha green tea. Ghana paired with a prominent lavender hue. A subtle 66% Caribbean dark chocolate ganache with lemon sunshine is sure to put a smile on your face. A tender Tahitian and Madagascan vanilla bean caramel enrobed in 38% Peruvian milk chocolate and finished with pink salt from the Murray river in Australia. Inspired by the cocktail, the mojito mint infuses fresh lime and mint with a 66% dark chocolate from the Caribbean for a tropical finish as good as the drink. Milk chocolate ganache infused with oranges and a touch of Grand Marnier dipped in dark chocolate. Tropical passionfruit milk chocolate ganache enrobed in dark chocolate. A classic combination of creamy milk chocolate peanut butter ganache topped with dark chocolate and chopped peanuts. Pumpkin spice infused milk chocolate ganache. A great treat to welcome fall. The world’s rarest chocolate and the first cocoa beans to be certified by the USDA as genetically pure. Pure Nacional is a 68% dark chocolate from the Fortunato plantation in Peru which features roasted nut notes ending with a soft floral finish. Organic raspberries and a hint of Chambord liqueur combined with a blend of Valrhona estate chocolates. A milk chocolate ganache infused with root beer and root beer schnapps to bring you back to the drive in. McClelland’s Single Malt Islay Scotch is paired with 85% dark chocolate from Ghana to create pure chocolate poetry. An interesting blend of three teas – chrysanthemum, sancha and lichee black tea – with a hint of fresh ginger. Smoky chipotle pepper blended with dark Ecuadorian chocolate and a note of espresso. A dark 69% chocolate from Venezuela with a splash of the classic Venezuelan rum, Diplomatico, which delivers vanilla and caramel notes. Milk chocolate paired with a Japanese citrus fruit, Yuzu. Personal and corporate gifts tell a story about you. Giving a locally handmade quality gift lets people know you really care. Make an even more personalized impression with your clients by ordering customized chocolates. We can apply your logo or artwork to our chocolates with coloured cocoa butter. Send us your artwork by email to brett@sweetlollapalooza.com in a 300 dpi JPEG format and we’ll provide a quote for one, two or three colour options. Please note custom orders take a minimum of 2 weeks to complete.